New Hampshire is graced with 54 covered bridges--historic architectural gems dating back to the late 1800's. There are many theories on why covered bridges were built. Some speculate that covering the bridges was done to make the wood structures last longer, make horse and cattle feel safer from the rushing water when crossing, or to provide safer passage in icy conditions. Truth be told--no one really knows for sure. Often called "courting or kissing bridges," they still invite romantic ideas of a simpler time. This, combined with mystery of the covered bridge concept origin, creates a nostalgia that fascinates. 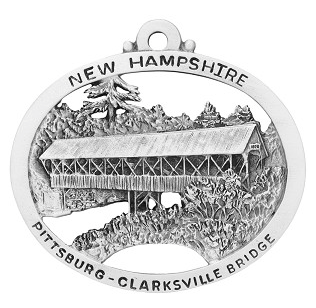 Hampshire Pewter has captured the beauty and wonder of these structures in our Covered Bridge Ornament Series. Built in 1876 by Charles Broughton of Conway, NH, the Jackson NH Covered Bridge was orignally known as the Honeymoon Bridge. Locals still associate the bridge with romance and the traditions of wedding photos and an annual bridge dance carry on there today. At the intersection of NH Route 16 and 16A, the Jackson Covered Bridge carries Village Street from Jackson Village across the Ellis River. 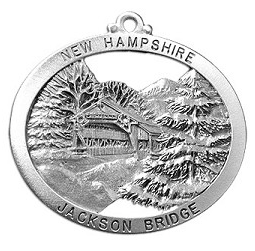 According to NHTourGuide.com, Jackson covered bridge is listed number 29-02-01 in the World Guide of Covered bridges (WGCB) and is New Hampshire covered bridge #51. The Pittsburgh-Clarksville Covered Bridge stands West of Pittsburg Village on Bacon Road connecting the towns of Pittsburg and Clarksville over the Connecticut River. Also known as the Bacon Road Bridge, it is believed to have been built in 1876 and was closed to traffic after 105 years in 1981. Of the remaining covered bridges in New Hampshire, the Pittsburgh-Clarksville Covered Bridge is the northernmost covered bridge crossing the Connecticut River. It is New Hampshire covered bridge #34. 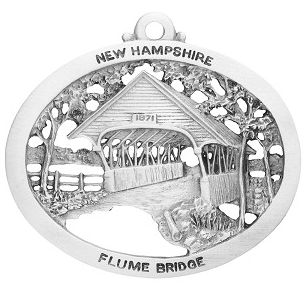 View the entire Hampshire Pewter Covered Bridge Ornament Series Collection. Locals and tourists alike make it their hobby to tour all 54 of the NH covered bridges. Get a map and seek them all out your yourself!